PENETANGUISHENE – Just the thought of an order of fish ’n’ chips can conjure up images of steamy packages wrapped in newspaper – despite the tradition being frowned upon as unsanitary these days. The tangy-sweet smell of malt vinegar is a typical component of the vision, followed by the tinkle of cascading salt. A chilled mug of another kind of malt can complete the picture. But whether the preferred garnish is ketchup or mushy peas, or the venue is a chip stand, diner or pub, this traditional British dish continues to be a favourite on both sides of the Atlantic – and in former colonies worldwide. Recently celebrating its 150th birthday, fish ’n’ chips harkens back to the gas-lit streets of Dickensian London, where a fried-fish warehouse was featured in his 1839 classic “Oliver Twist.” Today, there are a reported 11,000 “chippies” in the United Kingdom, serving up, according to the Federation of Fish Friers, 300 million portions annually. Although it’s a dish typically served deep fried, the federation asserts fish ’n’ chips comes with less than half the fat of pizza or a burger-and-fries combo, and a fraction of the calories. Other histories credit the nutrient-rich fish fare for keeping families fed during the Industrial Revolution, and for fueling the British war effort. Aye aye, captain. Serving up fish and chips and other comfort foods for 40 years in Penetanguishene, Ken Cowan has renovated and added a sports bar and has expanded his menu. In Southern Georgian Bay, the comfort food has been a staple for generations, with each outlet offering up a unique fish tale of its own. 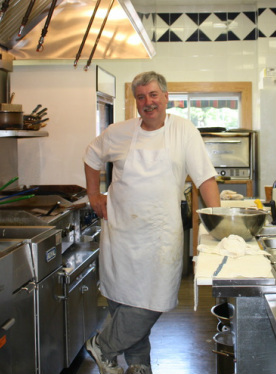 At 70 Main St. in Penetanguishene, for example, the 40-year-old popularity of Captain Ken’s Diner is as much a testament to entrepreneurial owner Ken Cowan as it is to the town’s love of local pickerel. When he was 13, Cowan asked family friend Mark Trottier for a part-time job. It would be the young teen’s third, which he juggled along with his schoolwork. He was soon managing the establishment, which was then a billiard hall and smoke shop. At 17, he bought the building and the business – and immediately introduced food service. Waffling in her plans even as she relates her family’s history, Kattie hasn’t yet ruled out the possibility of taking over from her dad when he decides to cut back on the 70-plus-hour work week he’s put in for decades. With a major renovation done last fall, the billiard tables were replaced by big-screen TVs and other accoutrements of a modern sports bar. Even the huge Fred Lenz mural that graced the entire wall are now fond memories. New additions of pasta, ribs and steak have been added to the menu. Hoagie’s are also still popular. Patrons can also have their pickerel, halibut, cod or Alaskan pollock battered, pan fried or baked. Shrimp and scallop baskets are also an option, as is the seafood chowder that’s created every other day. Those who prefer a less starchy option can choose from a variety of salads. Allergies can be accommodated as well. As a fully licensed restaurant, patrons can also have malt with their malt – choosing from ten varieties on tap. Open every morning for the breakfast crowd, Captain Ken’s only closes on Christmas Day. If you are looking for great food, friendly service, great ambiance then this is your place. Please check out our daily specials. Also something new to Captain Ken’s is he now takes reservations so please call 705-549-8691 to make your reservation today.